I feel immediately defensive praising a beer like I'm going to praise this one. Look, I'm as skeptical of rampant hype as much as anyone. I hate that I am now writing a review that is just going to add to that hype (yes, because Bear Flavored is a world-renowned powerhouse within the beer community), because no matter how much I or anyone loves a beer, someone else will be underwhelmed by it. Of course I expected to enjoy Heady Topper quite a bit; I figured it'd be a pretty good beer, you know? Heady is rapidly earning a reputation as the East Coast's answer to Pliny the Elder — "helped," sort of, by the devastating flooding in Vermont last year, which very tragically destroyed The Alchemist's brewpub, and forced them to focus solely on their brand new canning operation and their flagship beer (this one.) 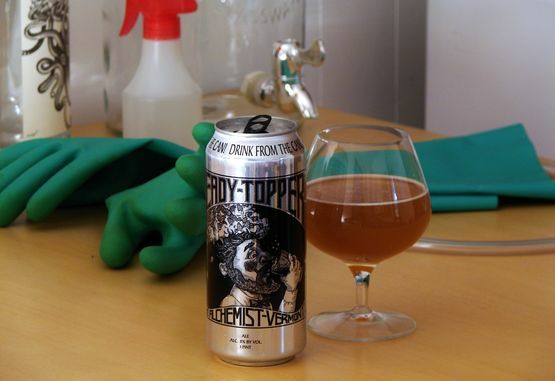 It was sad news, indeed, but at least Heady Topper isn't going anywhere — and every now and then the Alchemist is even going to send some down to New York. Before I spiral off the rails trying to fathom how good this beer is, I should probably try to tell you what it tastes like. The hop varieties in this have obviously been used in other beers, but I've rarely tasted hop flavors so rich and thick and juicy. The "imperial" strength of this beer is utilized much better than in others, as the rich semi-sweet body of the beer somehow adds to the hop character rather than the malt character. There's a burst of hops, and then the sweetness hits you, right in the middle, riding on a way of juicy hops before the bitterness smashes into your tongue. And oh, what a hop character this has: Heady Topper is thoroughly nuked with juicy hops. I'm going to use the word "juicy" a lot because there's just no better way to describe it. I've never had a beer taste so full of hop juice before. Pineapple, orange, mango, citrus. If I guess to guess what hops are in this, I would guess: magic hops. Printed all along the top of the can is a surprising suggestion: "DRINK FROM THE CAN!" I know, I know. It goes against everything you know about beer presentation and aromatics and "letting the nose open up" and all that, but dear god, they might be right. I poured half in a glass and drank the rest out of the can, and it is actually better out of the can. I don't understand why, or how, but the flavor is richer and fuller. This tastes exactly like hops were a fruit that you squeezed juice out of, and this is the juice. I expected there to be hop cones floating in my beer. It helps that the Alchemist goes to great lengths to ensure the beer is fresh. The cans I had were probably less than a week old, I'm guessing. Little more than a week later, when I drank the last of them, Heady already seemed to have lost some of the aroma from my first few experiences. If you try this at a month or two old, I suspect it won't be nearly the revelation that it was for me. It's possible that Heady starts higher (and hoppier) than any of its peers, but fades faster too. Either way, other IPAs at their freshest still can't touch this. I haven't had a beer take me by surprise like this in a long time. Even with all the hype surrounding it, even though this was one of those annoyingly insane releases where shops would sell out within 10 minutes, I only expected this to be a good IPA alongside many other good IPAs. I did not expect it to stand out like this. How the hell can an IPA be unique at this point? Everyone has tried every hop combination out there, what's left to do that'll make it truly stand out? Apparently something. Availability: 16 ounce cans, but I just called and they said you can't have any. Sorry. Amazing beer but could you please review Coors Light? I'll have to keep my eye out for that one, but I might have to have it shipped to me as I have no plans to go back east any time soon. It's interesting that their page says it's brewed "with a proprietary blend of six hops." A trade secret like that one is good to keep. As for your description of the beer it reminded me of sampling something Lagunitas brought by a local bar for SF Beer Week. It was one keg and they just called it "Wet Hop IPA." No official tap handle or anything. My wife actually found it first, declared it her favorite IPA ever, and I bought a pint with some skepticism. By Gambrinus's beard, was that amazing! The word "juicy" would have applied if I could have thought of it, were I capable of thought again. I've not heard of nor found it since, but that makes sense; if it's truly a wet-hopped beer, it was probably in limited supply anyway, and the fact that they stored it until February to showcase it proves how proud they were of their creation. Anyway, this is mostly to say "thanks" for expanding my beer vocabulary a little bit, and for writing so well about beers (again).